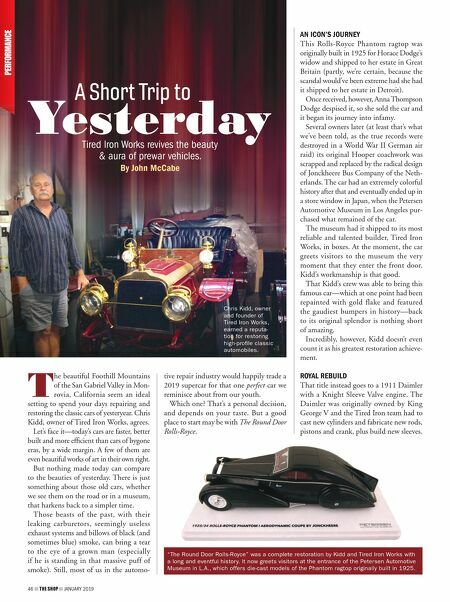 JANUARY 2019 THE SHOP 47 Like with the Rolls, this was a job that Tired Iron did for the Petersen Museum which, having sent more than a half-dozen vehicles to Kidd, qualifies as his biggest customer. Kidd is partial to doing sympathetic resto- rations, which is to say that the restoration is designed to make the car look just like it originally did, without adding glitz, mod- ernization or even safety features. Just as importantly, the car needs to run as well as it did originally. While many of the cars that leave the shop end up in museums, they all leave in running order. Tired Iron Works does more than sym- pathetic restorations, however. 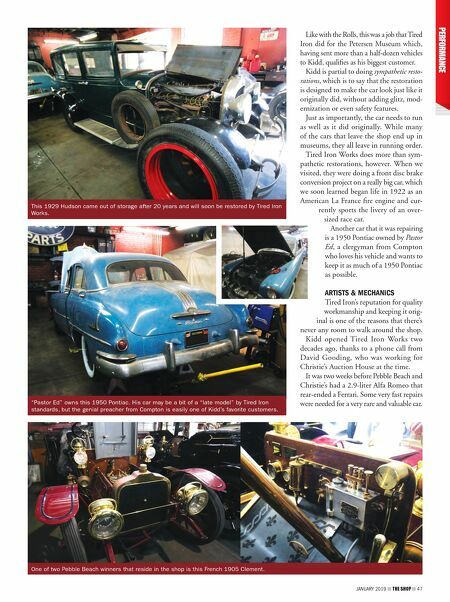 When we visited, they were doing a front disc brake conversion project on a really big car, which we soon learned began life in 1922 as an American La France fire engine and cur- rently sports the livery of an over- sized race car. Another car that it was repairing is a 1950 Pontiac owned by Pastor Ed, a clergyman from Compton who loves his vehicle and wants to keep it as much of a 1950 Pontiac as possible. ARTISTS & MECHANICS Tired Iron's reputation for quality workmanship and keeping it orig- inal is one of the reasons that there's never any room to walk around the shop. Kidd opened Tired Iron Works two decades ago, thanks to a phone call from David Gooding, who was working for Christie's Auction House at the time. It was two weeks before Pebble Beach and Christie's had a 2.9-liter Alfa Romeo that rear-ended a Ferrari. Some very fast repairs were needed for a very rare and valuable car. This 1929 Hudson came out of storage after 20 years and will soon be restored by Tired Iron Works. "Pastor Ed" owns this 1950 Pontiac. His car may be a bit of a "late model" by Tired Iron standards, but the genial preacher from Compton is easily one of Kidd's favorite customers. One of two Pebble Beach winners that reside in the shop is this French 1905 Clement.